Awesome photography nanu. Hats off. Which gears you are using while taking Pictures? you have done a great job man!! You need to take more care of these fries . Don't overfeed BS or BH . try to feed them BS at regular interval - 5 - 6 times with small qty . The batch is small hence pl ensure no left over of BS. Left over BS will get rotten and may create problem to the fries . Wipe the tank sides every day before WC . First four week after free swimmimg you need to take extra care of the fries . Shankar: I don't know about the demand for fries yet, I am just glad I got this far, this is the first time they have ever hatched for me, and I would love to keep as many as possible. Tirtha: Thanks man, I am using a normal point Canon SX100IS. Its my first Digi, and I am a noob in taking pictures, I think I just got lucky with those few. The nice thing is it has an "Aquarium" Mode, needless to say what it is for..
Shameek and Seetharam : Thanks a lot and yes will update it every 3-4 days with pics, for as long as they survive and are with me. before the weekend I hope that comes thru else I''ll have no choice but to start FBW or shaved BH. They are 15 days from Free swimming. She has developed a wound, which is now healing over the last 2 days, I am still a bit worried about it as it had some white stuff on the wound initially. but now the white stuff has gone, any clue what that might be? Also she has gotten a bit of white marks on her tail, I dont know what they are but I have up-ed the temp to 31'c from 28'c, and now they are looking better. Any help on this would be nice..
Can I add salt to the tank with fry? I dont want to try and add any other meds to it as it doesnt seem that serious. The male is doing much better than her though no sign of stress, and they both share the kids workload equally. I have been doing 50% WC everyday with normal hard water now, no more soft water as it gets expensive to continue WC on soft water. I do wipe down the tank before WC. The famale hates me doing WC and has several times knocked the gravel vac. When will the fry start to accept crushed Flakes? or shaved BH? When is it time to remove the parents? BTW. I tried counting them they are close to 30 and I can already see 1 cull for sure, 1 with bent body. I just hope they remain a minimum. There is no need for you to buy a Tin , you comes to Mumbai regularly , just a phone call and I could have helped you with this . 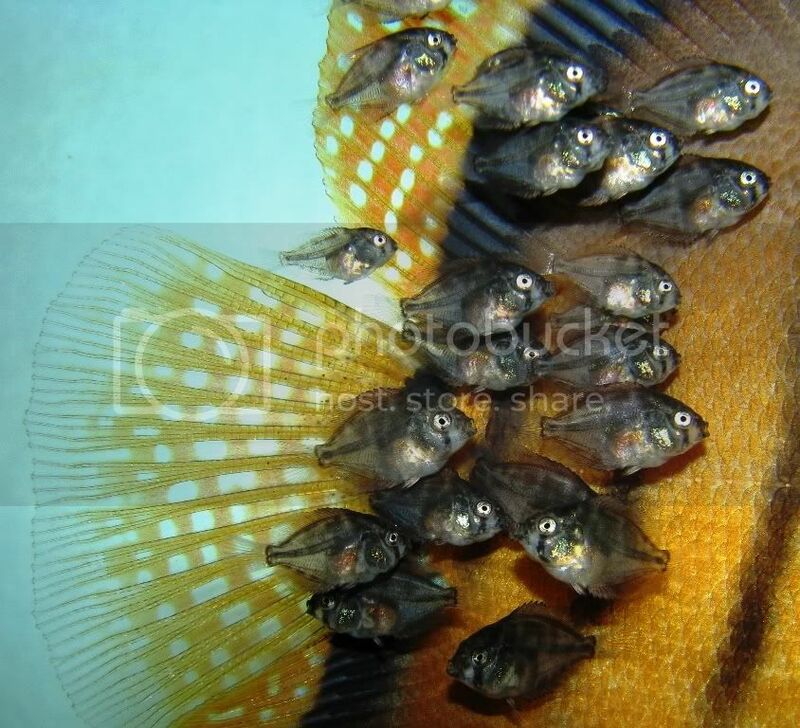 why to purchase when we are there to help you .Not feeding the Brine Shrimp to fries , the parents are at risk, more streess to the parents ( fries may be continiously pricking the slim ) . be careful next time , sometime due to heavy pricking and secoundary infection female succumb to infections and dies . At this stage , I feed 5 - 7 times Brine shrimp at every two hrs intervals , to avoid heavy pricking of fries of slim . This is secoundary infection due to heavy pricking by fries due to nonavailability of other food to the fries . Don't increase the temp , increase in temp will increase the metabolisium of fries and hence more pricking , and more problem to the parents . Just keep very good water quality and clean sponge filters every alternate day . feed finely shaved BH in small qty . try to introduce Brine shrimp at the earliest or else you need to seperate them at the earliest to save the parents from any infection . Pl keep us posted about the condition of the parents and the fries . Unfortunately, my next trip is only planned at the end of the month, so thats sometime away for now.. Else I would have surely taken up that offer. 1. When do they start accepting crushed flakes or finely shaved BHM? As I would like to try that out tonite when I get home. Or is there any other alternative to BBS? The male is smaller than the female but doesn't seem very stressed, and is with the kids more now. I think cause the female is getting tired of them. As that would mean I should keep the parents in the tank for longer...but that also means a higher change of chance of infections/parasites getting to the babies from the parents...? 4. What about the egg yolk and Spirulina mix, can I try that? or thats just for the fry when they have just become free swimmers...? Looks like I need BBS more and more. 5. What preventive meds can I or Should I put in the tank for the fry care if any...? Not that I like to add meds. but prevention is better than cure. There is no need for you to buy a Tin , you comes to Mumbai regularly , just a phone call and I could have helped you with this . why to purchase when we are there to help you .Not feeding the Brine Shrimp to fries , the parents are at risk, Â more streess to the parents ( fries may be continiously pricking the slim ) Â . be careful next time , sometime due to heavy pricking and secoundary infection female succumb to infections and dies . At this stage , I feed 5 - 7 times Brine shrimp at every two hrs intervals , to avoid heavy pricking of fries of Â slim . 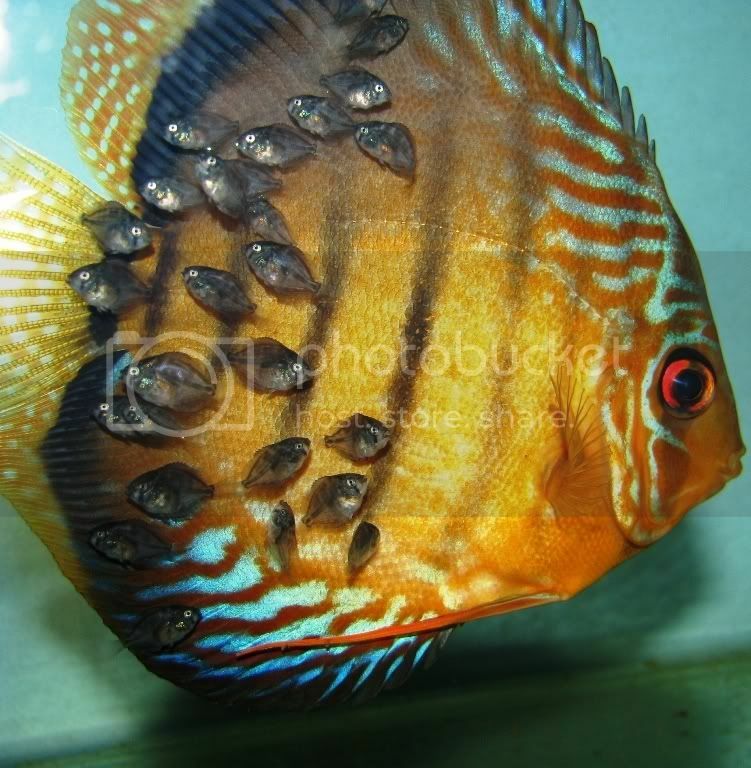 You do know your Discus don't you ? Congratulations! Excellent pictures and the fry seems to be in good health. If i remember correctly your discus were laying eggs for some time did you do anything recently that made the eggs hatch? Just realised that was almost a year ago. I believe the difference was the water if you ask me, I went form hard to soft peat water and they started to hatch. And I went to for vacation to Nilgiris for 10 days, my welcome back were these wrigglers...So I really did nothing special. Shiva: I finally sourced some BBS. Below are todays pictures just taken, this time with Dad. Tomorrow they shall get some BBS. When do they start accepting crushed flakes or finely shaved BHM? Normally on 3rd or 4th day you should start feeding the fries with Artemia nauplii, initially you should start with small qty , and slowly you should increase the feeding . If you put too much of live artemia in to the tank parents fish sometimes gets irritate. after 10 days you may start some finely ground any animal heart . The parents will pick the food and blow it out , scattering it to encourage the babies to feed . In your case female is sick and it is not advisible to seperate the fries or the parents when they are sick . The fries may be looking healthy because they are still consuming anti-bodies from the mucus of the parents and once they stop consuming these anti-bodies they may fall sick . IME whenever nursing parents fall sick their fries also falls sick . hence one should be very careful during these 3 week time . Transfer have to be done only when both parents and fries are in good health . This is the reason one must disinfect the breeding tank and clean the parents before breeding . I think I had mentioned this in one of the earlier post ( cleanning the parents ) . Pl monitor the health of the parents and keep us posted , if they are not improving we need to do something ( may need to use antibiotic ::::::::::;??????????? ) . try feeding Artemia . 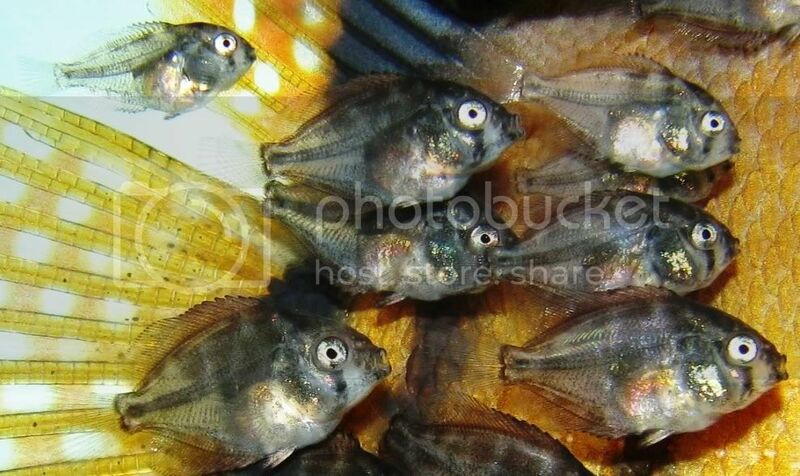 Looking at their belly , i think they may be consumming heart meal which is scattered at the bottom of the tank . start finely ground animal heart . I think you meant Ritesh ? The female does look better, I will post pics of her tonite and you can have a look at her and advise. Also the Artemia Hatchery has started hopefully they'll get their first meal tonite. This I hope would relief the parents quite a bit. Does the male look ok? I mean I know he doesn't have the best of shapes, but as far as health goes? the fry look too cute for words.